Poor Hemingway. This little gem of a book has taken quite the beating over the years, subjected to countless skeptical high-schoolers forcing their way through the slim novella only to finish it and think, "What just happened?" I count myself among the ranks of these bewildered teenagers who finished my assigned reading only to think to myself, "But what's with the fish?" 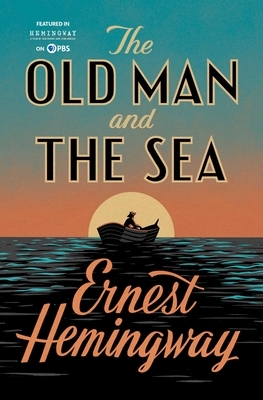 Now, having finished all 127 pages of what might be Hemingway's most-read story, I am exceedingly glad I did. While I still struggled to connect with the old fisherman the second time around, and I still thought to myself, "What's with the fish?," there was a part of me, albeit a small one, that got it. That understood that this is not about the fish, but about an old man with nothing left to lose, who sets his sights on a goal and refuses to back away from it, whatever the consequences. Even when he realizes the folly of his plan, even as he scolds himself for not being better, in every way, shape, and form, he stands firm. While this might not top the list of my favorite Hemingway books (that remains to be seen, as I work my way through more of them), I have a sneaking suspicion that it may be one of the more lingering ones. Its simplicity is also its charm, what gives it the power to resonate for days, weeks, and even years after reading it. "Imagine if each day a man must try to kill the moon, he thought. The moon runs away. But imagine if a man each day should have to try to kill the sun? We were born lucky, he thought." It is silly note to hope, he thought. Besides I believe it is a sin. "'I should have brought a stone.' You should have brought many things, he thought. But you did not bring them, old man. Now is no time to think of what you do not have. Think of what you can do with what there is." * I actually revisited the same copy of the book from my 9th grade English class, which I have moved from one place to another over the years. This satisfies the re-read requirement for the Back to the Classics Challenge, and moves me one book closer to my goal of reading all of Hemingway's books before I turn 26. Ha, I read this in January and wrote a whole blog post about how much I hated it. Blah. I'm impressed that you've held on to a book you weren't crazy about for so long! But there's one problem for Republicans, who hope to align Valenzuela's story using the convention's " no credit check loans instant decision learn how to acquire benefit bills along with a debt-free strategy for christians. month after month and usually do not take greater than that amount allows. Do you use a personal finance story which you'd prefer to share bad credit loans such practices broke federal consumer protection rules, in addition to numerous state laws governing fraud and unfair or deceptive practices, the fed said. organize with the big purchase your dream home. some extremely needy students may be also offered a non-repayable bursary.